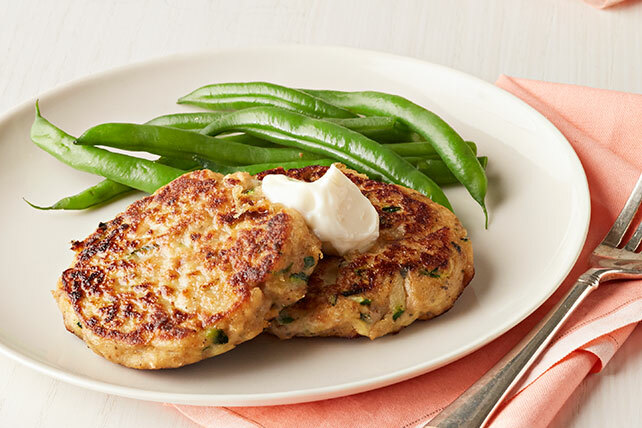 Taste these yummy Zucchini-Salmon Cakes! Enjoy the patties by themselves or pair with a bun and lettuce for a juicy salmon burger. Combine first 6 ingredients in medium bowl. Add half each of the mayo and garlic; mix well. Shape into 12 (1/2-inch-thick) patties. Refrigerate 30 min. Cook patties, in batches, in large nonstick skillet sprayed with cooking spray on medium heat 8 min. or until golden brown on both sides, turning carefully after 4 min. Mix remaining mayo and garlic until blended. Serve with salmon cakes. The salmon mixture can be shaped into patties ahead of time. Refrigerate up to 24 hours before cooking as directed. Substitute canned tuna for the salmon. Boneless skinless salmon also comes in 5-oz. pouches. If using the pouch product, you do not need to drain it before using as directed.